Vanilla planifolia, the vanilla orchid, is the most commercially important orchid species, because it produces vanilla flavoring. The vanilla bean, where the flavoring comes from, is actually the orchid's seed pod. In the wild, it is pollinated by a rare bee species, but in cultivation it's usually hand-pollinated. They are native to Central America and nearby areas, such as Mexico, south Florida, and parts of South America. Biologically, the Vanilla subfamily branched off from the rest of the orchid family early in its evolution. There are a few other genera within the subfamily, but Vanilla is the most notable. 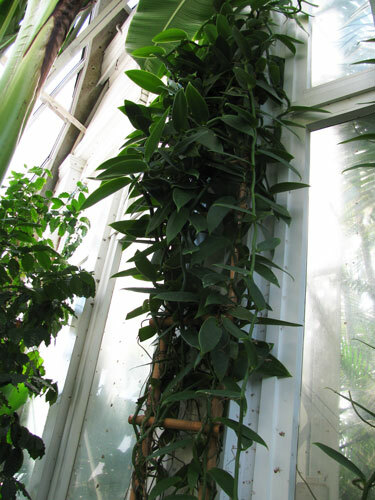 Orchids from the Vanilla genus grow monopodially as vines, making them unusual among orchids! It's good to have a trellis, tall piece of tree fern, or other support to grow them on, as they can reach many meters in length. You can pot them in sphagnum moss in a plastic pot, but the plant will soon grow far beyond the pot and not be very dependent on it; it will rely mostly on its aerial roots. Misting frequently will then be the preferred way to water, and the plant will appreciate high humidity, perhaps 70%. 50% is probably a minimum for good results. They should be watered when they are approaching dryness, as they don't have a very effective way to store water. Due to the plants' size and humidity requirements, they are most easily grown in greenhouses or (in tropical climates) outdoors. Warm growing conditions work well. Try for the upper 70's to lower 80's Fahrenheit (24-29C), with a 10-15°F drop at night (6-8C). Medium or high lighting conditions work well; in the wild, the plant will grow all over one or more trees and usually some parts of the plant get more light than others. Try for light intensity of 2500-3500 footcandles, or bright indirect light. Individual Vanilla flowers don't last very long; one day per flower is typical. But they smell nice and you get a series of flowers on each inflorescence, continuing for a month or two.